It feels a bit repetitive to even be posting this Yarn Along photo, but it's where I am right now. 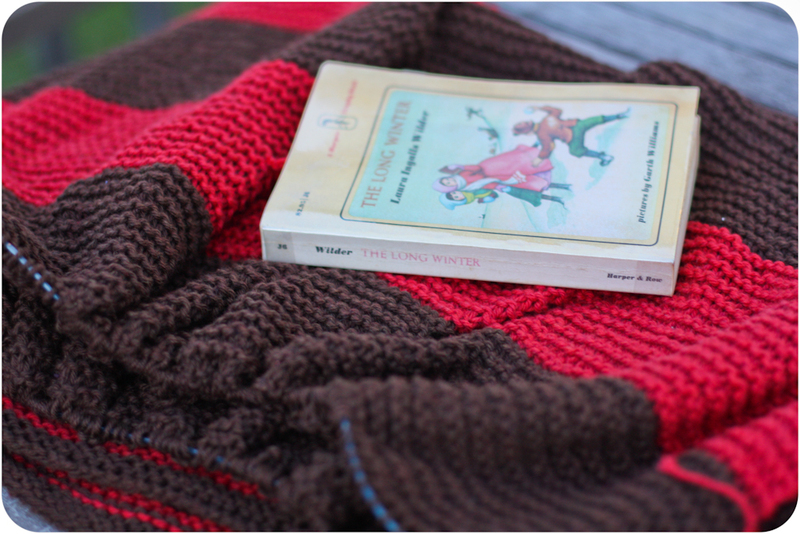 Still working on the same blanket, still reading the same book. 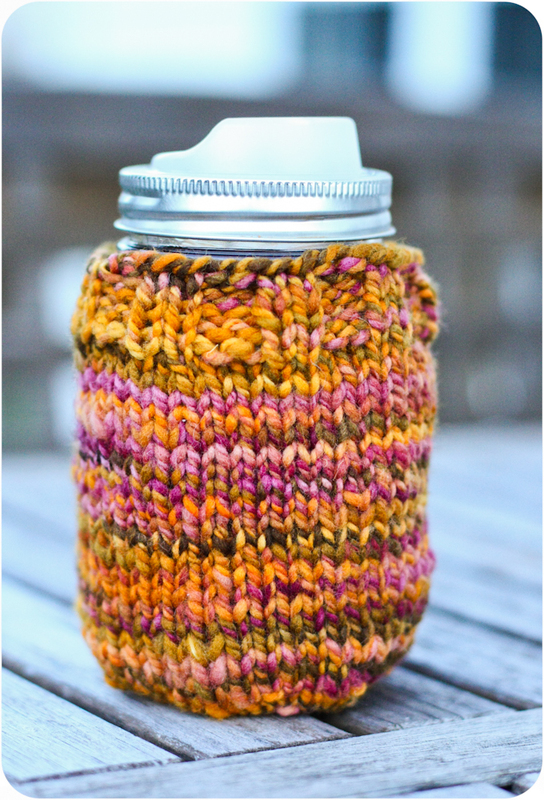 Lest you think the world has been entirely monotonous, I did pause one day to make this cute little mason jar cozy. A while back I ordered a couple of these Cuppow lids to use with mason jars for drink coffee, kombucha and smoothies. I found that I used them occasionally, but I thought that I might use them more if the jars had a cover to keep my hands from either freezing or burning, depending on the contents of the jar. I found a Ravelry pattern that I used as a guide, rummaged through my stash for some scrap yarn, and made this useful little jar cozy. I think it might come in particularly handy on an upcoming camping trip. How wonderful it will feel when you do finish your blanket! 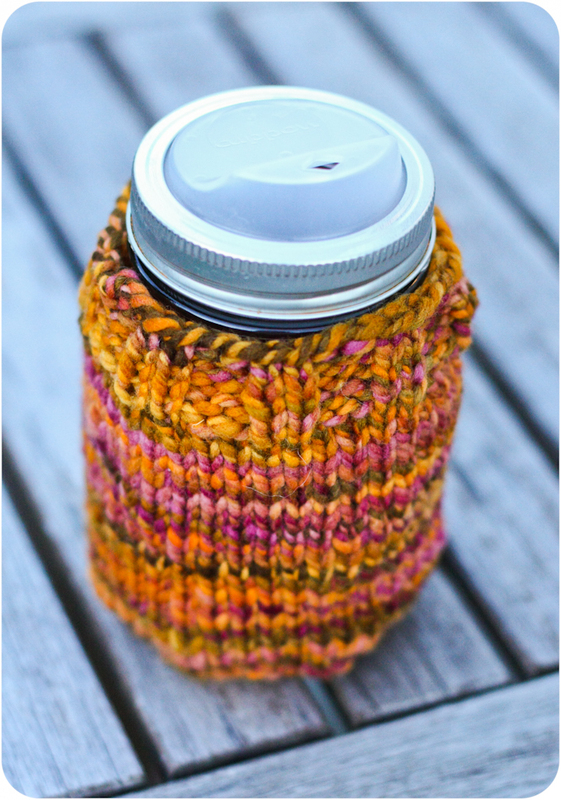 I also use mason jars for my drinks and have crocheted wool covers. Love the cozy. We are reading this book as well. I find this one a little sad and hard to get through. And I always find myself cold! That's a clever idea for a jar cosy. I'm surprising myself by still juicing and smoothie-ing now that the weather is getting colder. I adore The Long Winter but always gain weight when I read it because I get the urge to feed myself whilst reading of the shortages - like a primal reaction, almost! the cozy is cozy looking! I don't remember the blanket so it looks brandy new to me and I like it! I've been wanting to make one of those cozies. Joy, I love the colors in the cozy, my favorite time of year shows up so well in handmade goods. Your work beautifies and enlivens all around you and those who are near as well. I have crocheted a couple dozen of these for water bottles in my house-beloved visitors carry them out the door nearly as fast as I can produce them !~! Great gifts and always welcome, as you say, whether the drink is hot or cold. My knitting needles and I need to re-acquaint ourselves; i'm trying to find a quicker way than setting the needle down each and every step in order to work the yarn with my left hand. I LOVE LOVE the colors in your jar cozy. It's exploding with fall, yet it would totally work in spring too. Perfect! Hey Joy! That Cuppow thing is awesome looking and the colors of the cozy are my fav. - perfect for fall. =) Oh, and Long Winter is on our list of next read alouds, but I don't want to start it until it's actually winter..well, officially winter. I can't wait til it's actually winter because I will be waiting forever, here in TX. the long winter can be so looooong! we're about to read it, and i'm sort of dreading it because I already feel the chill!